Jim wrote a very compelling article for The VHA Voice on the importance of uninsured motorist insurance and why every cyclists should have it. The VHA Voice said "our goal as the Bike Friendly Advocacy Group is safety when we ride. This article, written at our request by bicycle attorney Jim Dodson, reflects on another aspect of safe cycling, accidents involving other people and vehicles with no insurance to protect us, their victims." You can read this article, Uninsured Motorist Coverage | Do Not Get On Your Bike Without It, here. 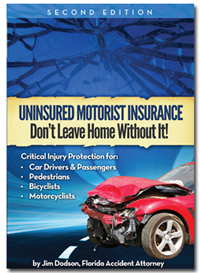 You can also download a free copy of Jim's easy-to-read guide on UM, Uninsured Motorist Insurance - Don't Leave Home Without It! In fifteen minutes you can find out why it's so important to have UM on your auto insurance policy.